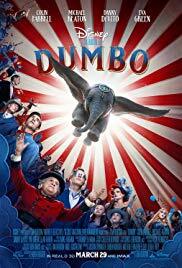 Facing a financial crunch the Medici Family Circus has fallen on hard times, so, in an effort to bring in the crowds Ringmaster Max Medici (Danny DeVito) invests in a pregnant Jumbo Elephant. Before long it’s baby elephant time, trouble is, this baby has ginormous ears; the silver lining, these same ears make it possible for him to fly. Now the star of the show, the amazing flying baby elephant is sought out by the shifty purveyor of entertainment, V.A. Vandervere (Michael Keaton). With a promise of fame and fortune the Medici circus joins up with Vandervere at his amusement park known as Dreamland; but, before long the thin veneer wears off and not everything is as it seems. It will take the circus as a whole to set themselves free from Vandervere’s scheming ways. Directed by Tim Burton and Written by Ehren Kruger based on Helen Aberson’s novel, this Disney classic tale brings out the heavy hitters to make the magic real in this surprisingly emotional David and Goliath tale. Adding Danny Elfman in on the film’s score plus the endearing ensemble including Colin Farrell, Nico Parker, Finley Hobbins, and Eva Green, the recipe is complete for a spectacle of grandiose proportions. Richly polished CGI goes on to add stunning realism to the computer generated elephant and surroundings. All round, it’s a delightful winner for the weekend, even for those already familiar with the story. Dumbo is rated PG.